This boy's "All-American" romper features your little guy's initial out of baseball fabric along with his name embroidered in blue on the front of a red short sleeve romper. Available in sizes 6 mo, 12 mo, 18 mo and 24 mo. These run SMALL. Please order larger than normal. For example, the length of the size 12 month romper from shoulder to crotch is slightly shorter than a Carter's brand onesie from shoulder to crotch. Please specify size and name (please check spelling) during the checkout process. If you are interested in other colors, please contact me. This onesie is comfy for a baby yet still an instant attention grabber for the diva! 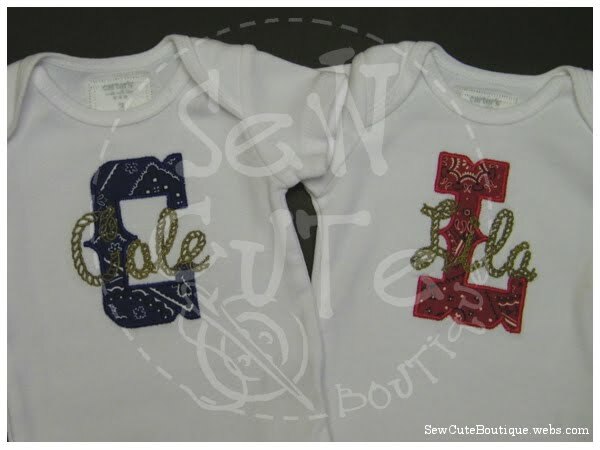 I start with a high quality Carter's brand bodysuit and applique the initial in zebra fabric and embroider the name in bright pink on the front. This really is an outfit made for a little diva. It makes a fabulous baby shower gift! Just imagine all the oohs and awws you'll get. Price shown is for SHORT SLEEVES. If you desire long sleeves, please also purchase the "Long Sleeve Upgrade." 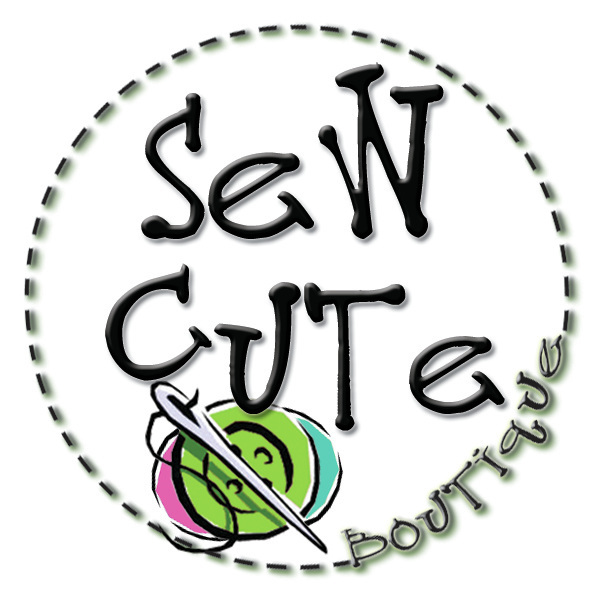 Specify size and name to be embroidered. Please check your spelling as I will embroider it exactly like you spell it. Other sizes available by special request. 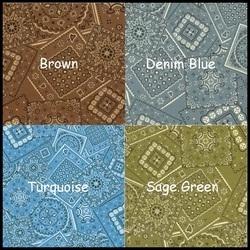 Other fabrics and color schemes also available by special request. Isn't this toooo cute!!?? Rows and rows of soft, bright pink chiffon are gathered on the bum of the Zoey Ruffle Bum Onesie sold above. Zebra and bright pink double ruffle hair bow. 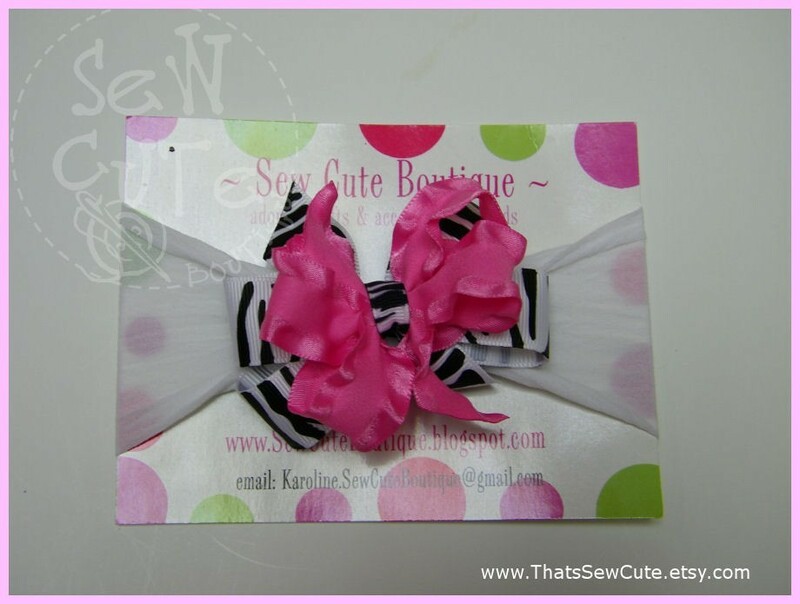 The bow measures approximately 3" wide and is attached to a partially lined alligator clip. It is attached to a very soft and stretchy nylon headband which will fit babies newborn through approximately 6-9 months, maybe longer. After that, the bow can be removed from the headband and worn on its own. If you desire long sleeves, please also purchase the "Long Sleeve Upgrade." Other sizes available by special request. 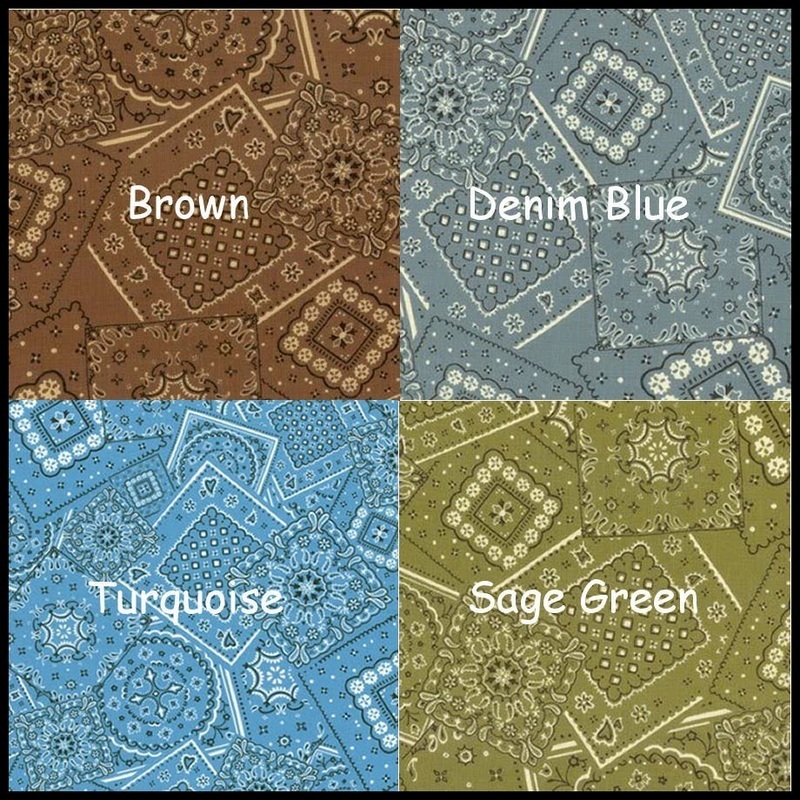 Other fabrics and color schemes also available by special request. 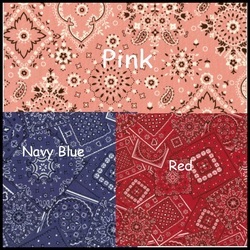 See additional bandana fabric colors below. 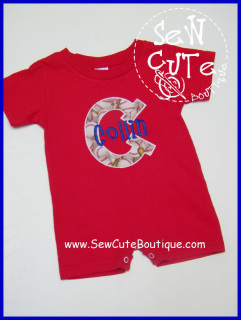 The front features baby's initial in a western font applique with bandana fabric... blue for boys and red for girls (unless otherwise specified). Then baby's full name is embroidered in a unique rope font. The rear pockets on the boy's set are "real", functioning pockets! There are three rows of full and fluffy ruffles on the bum of the girl's set. 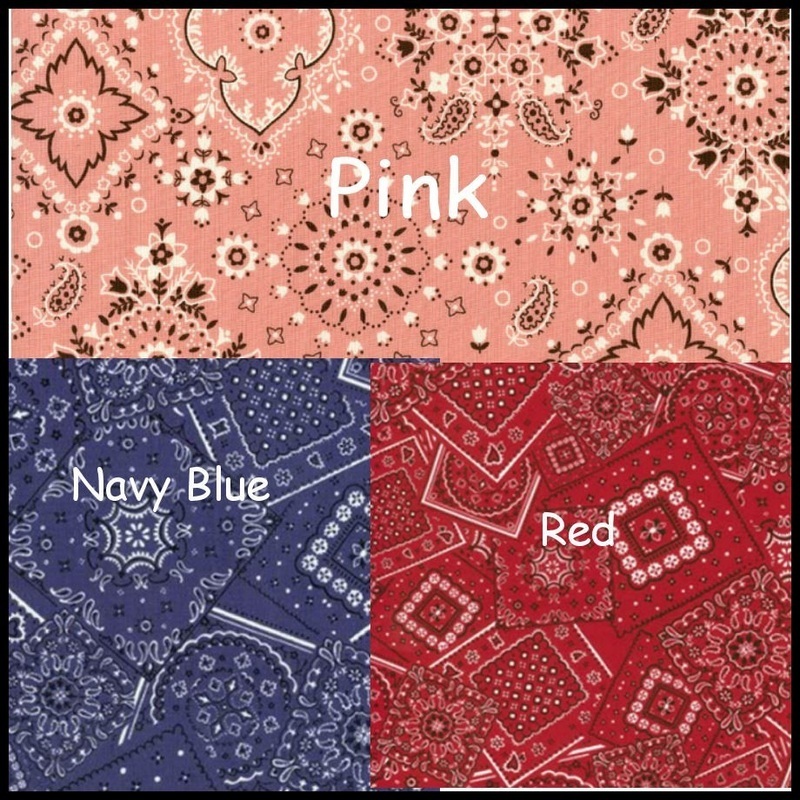 Please specify: girl or boy, bandana fabric color, name (please double check your spelling). 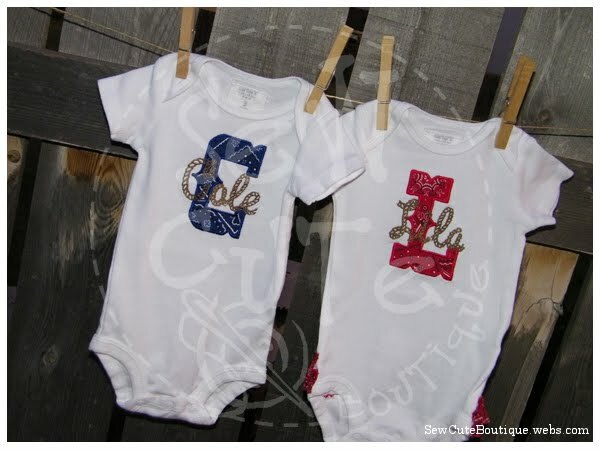 Fun for a baby shower gift, going to the fair and rodeo, or just hanging out at home. 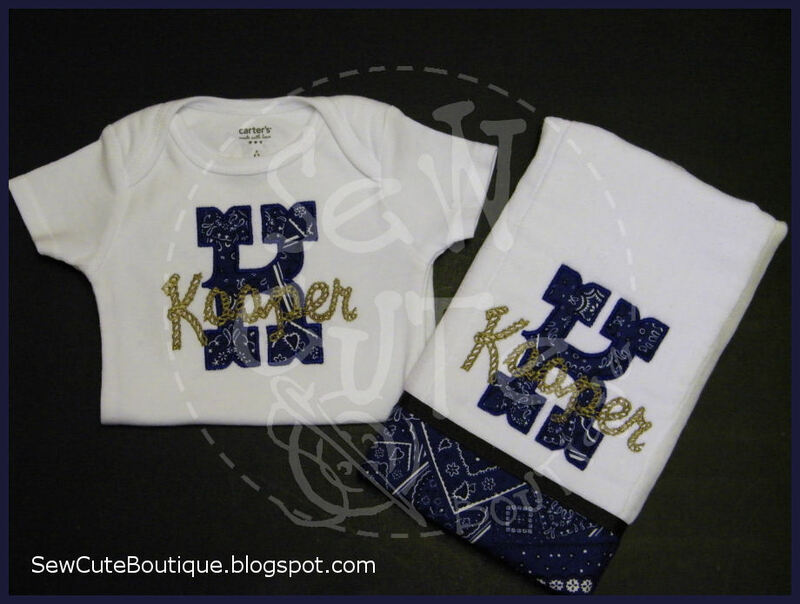 Add a burp cloth to match the above western onesie. 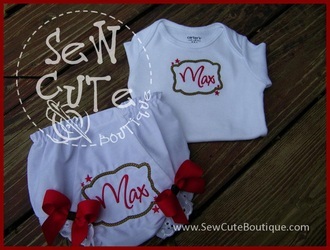 The onesie is not included in this listing but can be purchased separately above. I start with a high quality cloth diaper (no thin, flimsy, gauzy ones here!!) 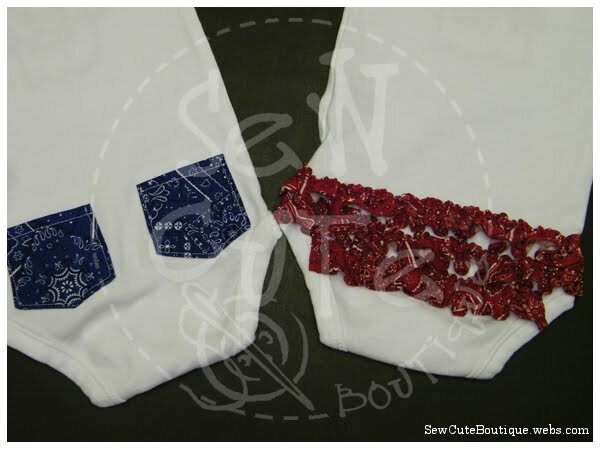 and add the same Western bandana initial and rope font name as well as a band of the bandana fabric along one end of the cloth. 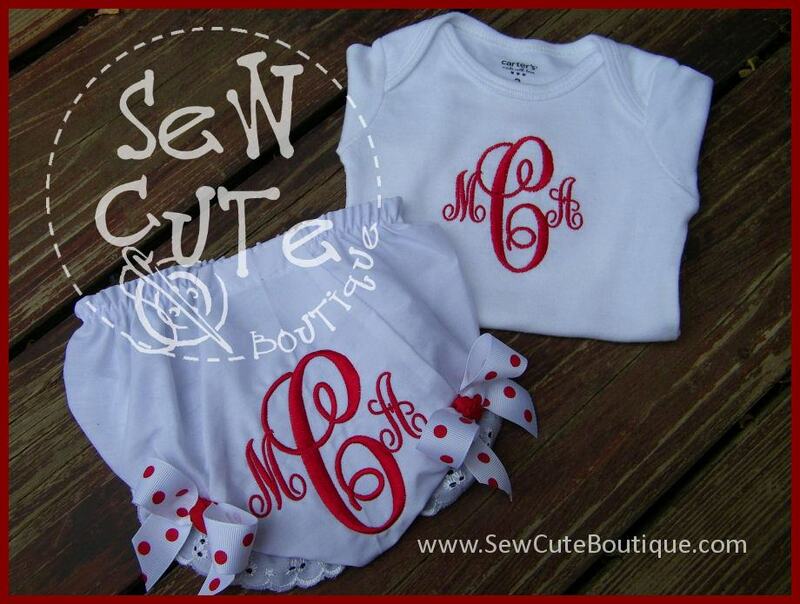 This makes a fabulous baby shower gift! Please specify initial and name. If you desire a long sleeve t-shirt or onesie, please purchase this upgrade in addition to the t-shirt or onesie that you want. 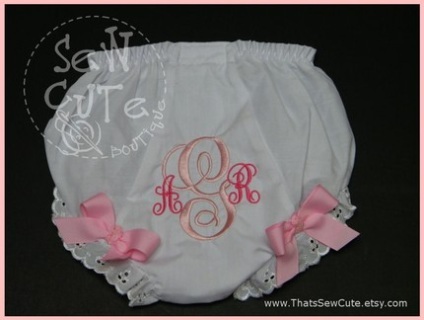 The perfect accessory to complete any little Diva's outfit... cover up those ugly diapers in style with these elegant monogrammed bloomers/diaper covers. 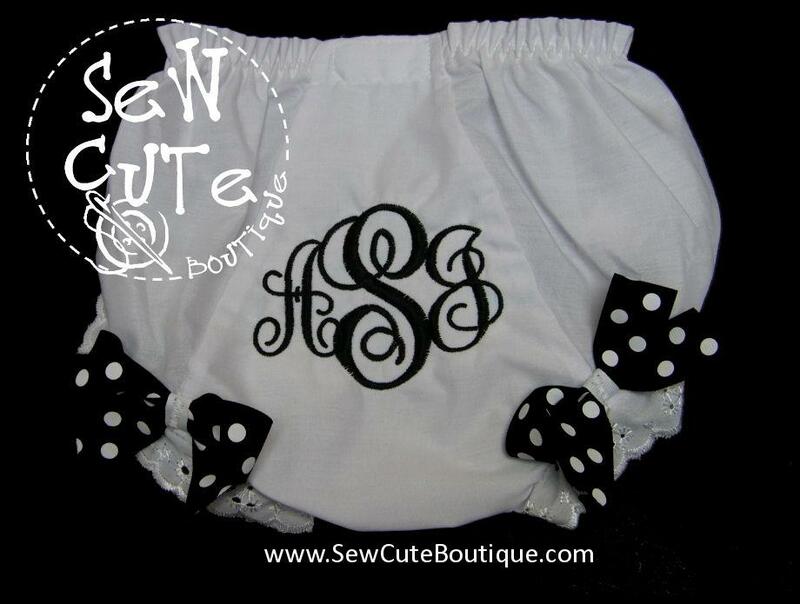 On check-out, please specify initials in the order you would like them sewn, usually first, last, middle. I will sew them exactly in the order you give them to me. Also please specify thread color/colors. I have 61 colors of thread, so I'm sure I can fill your request. If you request more than one color, please specify which letter to be sewn in which color. Sample is shown in light pink "G" and bright pink "A" and "R". 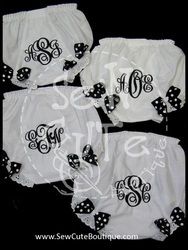 If you prefer a name, wording, or other design instead of a monogram, please contact me first. Bows on the legs are included in the price. 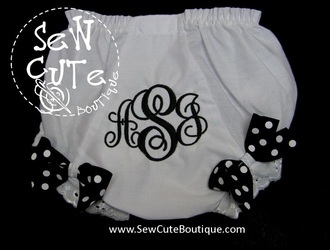 The ribbon ends are heat sealed to help prevent fraying and the bows are machine stitched to the bloomers for durability. Bow colors/patterns may vary based upon availability, but will coordinate with thread colors chosen. If you prefer not to have the bows, please leave me a note at check-out. These make a great gift! Matching onesies are sold separately.